Click to listen to episode (3:30). From the Cumberland Gap to the Atlantic Ocean, this is Virginia Water Radio for the week of October 22, 2012. The Fall Line, or falls zone, along Virginia’s rivers helped shape the history of human settlement in the Commonwealth. Through modern scientific study of Fall Line geology and chemistry, this distinctive geographic feature now is helping shape our understanding of the much older history of earthquakes in eastern Virginia. Thanks to the College of William and Mary for permission to use this week’s sounds. 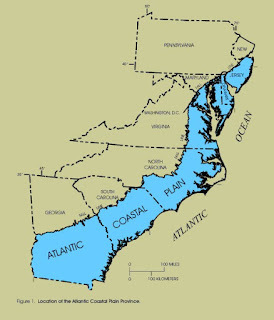 Figure: Blue shading indicates the Atlantic Coastal Plain, with its western edge marked by the Fall Line, or fall zone, the region in which the William and Mary earthquake research on the North Anna River is being conducted. In Virginia, the Fall Line approximately follows Interstate 95. Source: “Design, Revisions, and Considerations for Continued Use of a Ground-Water-Flow Model of the Coastal Plain Aquifer System in Virginia,” by E. Randolph McFarland, U.S. Geological Survey Water Resources Investigations Report WRIR 98-4085, accessed 10/22/12 online at http://va.water.usgs.gov/online_pubs/WRIR/98-4085/g-wfmcpasys_va.html. Acknowledgments: This week’s sounds were excerpted from the video “Looking for earthquakes: from the riverbed to the research lab” (approximately four minutes), produced by David Williard, College of William and Mary Office of University Relations, June 22, 2012; accessed online at http://www.wm.edu/news/video/index.php#more (see under “Scholarship/Research”); used with permission. Sources and more information: A U.S. Geological Survey (USGS) “live chat” video (about 28 minutes) on eastern U.S. earthquakes, held three days after the August 23, 2011, earthquake centered in Virginia, is available online at http://gallery.usgs.gov/videos/441#.UHwXNYaCvSg.